Starting this coming Friday, May 6th, AT&T customers will have the opportunity to pre-order the Samsung Galaxy Tab E 8.0 tablet. The slate can be bought for $0 down, with 20 monthly payments of $10. For those of you who have trouble with math, that works out to $200. And for $10 a month, you can add the tablet to your Mobile Share Value Plan. The slate can be bought in either Smoky Titanium or Frost White. 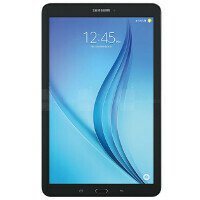 The Samsung Galaxy Tab E 8.0 features an 8-inch screen with an 800 x 1280 resolution. Under the hood is a Snapdragon 410 SoC with a quad-core 1.3GHz CPU and the Adreno 306 GPU. 1.5GB of RAM is inside along with 16GB of expandable native storage. A 5MP camera is on back, with a 2MP snapper on front for selfies and video chats. A 5000mAh battery keeps the lights on, and Android 6.0 is pre-installed. The tablet comes with secure sandbox Samsung KNOX, which allows you to use secure enterprise-ready apps apart from the regular apps you use for play. The integrated DIRECTV feature allows you to set your DVR while on the road. If you're looking for a serviceable tablet at an affordable price, the Samsung Galaxy Tab E 8.0 might be for you. If interested, click on the sourcelink. We should point out that the tablet has already been available on Verizon, Sprint and U.S. Cellular. Find me a 2 in 1 that is as light as a Samsung Tab. The reason it's my go to device for bedtime browsing and movie watching is its weight. My tab is 298 g Do you bring your surface to bed? Yes I use my Surface Pro during bed time a lot. I don't need to carry it while in bed, the kickstand pops out and keeps it standing on my side table while my hands remain relaxed. Similar to this: https://db.tt/GbO6FHte Regardless, if weight is your only concern, there are 2-in-1s like this: http://www.gearbest.com/tablet-pcs/pp_328162.html The top half alone would weigh equivalent to your Galaxy Tab, but as you can see, it dual boots Anroid and Windows. Still cheaper than this Tab E 8.0...there's probably a lot more just that website alone. Whichever work for you. I use my Dell 7140 for all lot of thing including playing with Remix OS. Bring it to bed is not as comfortable as my tab S 8.4 especially eBook and manga reading. Galaxy Tablets don't manage memory. AT ALL. This tab is a load of crap. Samsung tab s pro was probably the only Samsung tablet even worth looking at, but after comparing it to the new XPS 12, it seems Samsung can't make tablets at all, then again, no 3rd party really takes android seriously on tablets. Really? The Galaxy Tab S Pro seems like a much better tablet than the XPS 12. The XPS 12 is heavier and much thicker than the S Pro and it also has much worse battery life. Is this better than the tab S2? I dont know but one thinkg i know that Samsung Galaxy Tab S2 8.0 gets Android 6.0.1 in the UK today.